A little while ago we had some friends over at our place to have some food together and to celebrate first year anniversary of my blog. So, I prepared a little special meal for our dear friends. Today’s post as well as the last two posts of Chakri Samosa Chaat and Badam Doodh Dessert were the ones that I made on that weekend. 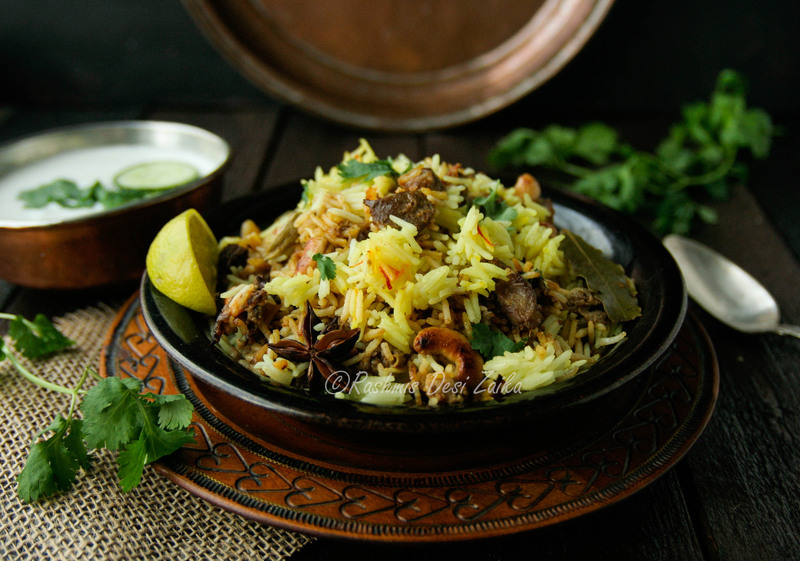 So today’s recipe is Hyderabadi Lamb Biryani. Biryani, one of the most popular dishes from India, is an evergreen classic dish and really needs no introduction. Just imagine fluffy rice which are cooked to perfection with tender and juicy lamb pieces infused with aromas of the spices like cardamom, cloves and saffron and finally richness and wonderful flavor of ghee. Biryani is believed to be introduced first time by Mughals in India. The recipe evolved and some of the places like Lucknow and Old Delhi in North India and Hyderabad in South India became noticeable for their style of biryani. The style and ingredients used to cook biryani differs a lot across different parts of India. The traditional way of making biryani involves cooking rice and meat separately and finally cooking them together by forming layers of each in a vessel, which is then cooked in dum method. This method involves sealing the vessel tightly so the aromas and moisture is trapped and then cooking it on low and slow heat. 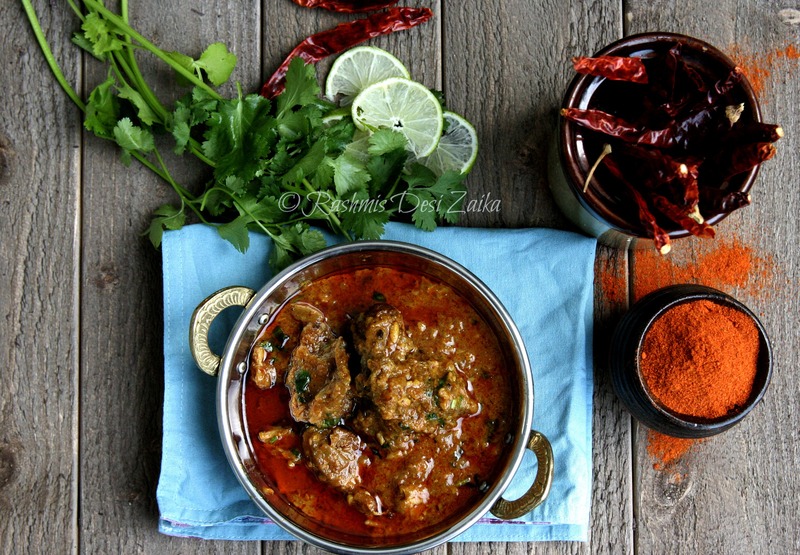 Hyderabadi biryani can be cooked in two ways-Katchi biryani is prepared with meat that has been marinated with spices and yoghurt for longer time and then sandwiched between layers of basmati rice -and Pakki biryani, where meat is marinated shorter time and cooked before being layered with rice. For both versions the layers of rice and meat are cooked on dum. The cooking time for katchi biryani is longer and requires meticulous attention of time and temperature. The biryani recipe that I made came out really nice and we had it with cucumber raita. Everybody really enjoyed it!! So, here is my recipe..
Mango paste is used as a tenderizer. You can also use raw papaya paste instead. In a open pan heat enough oil. The oil should be hot but not too hot. Gradually add small batches of sliced onions and deep fry them on medium high heat until golden brown. Remove from heat and drain them on paper towel. Keep them aside. Take lamb pieces out from the fridge and place them in a large bowl. Add mango paste, ginger paste, garlic paste, grinded spice mixture, garam masala, red chili powder, turmeric powder, half of fried onions crushed, yoghurt, chopped green chili, coriander leaves, mint leaves and oil. Mix everything together and let it marinate for two hours at kitchen table. Place a deep pot on medium heat and heat 2-3 tbsp of oil. When the oil is hot add bay leaves and let it cook for a minute. Add into it diced onions and sauté until they slightly soften and then add diced tomatoes. Let it cook for 3-5 minutes and then add marinated lamb meat. Stir everything together, cover the pot and let if cook on low to medium heat for 2 hours. Stir occasionally in between and add of dash of water if needed. The meat should be tender and falling of the bone. When lamb is done remove the bones from the meat. Keep aside. Rinse the rice with water Heat 1.5-2 L of water in a large pan. Add salt, bay leaves, cardamom, black pepper corns, star anise and cinnamon and bring it to boil. Add drained rice and cook till until they are three-fourth done. Remove from heat and strain the rice, reserving little bit of cooking liquid. 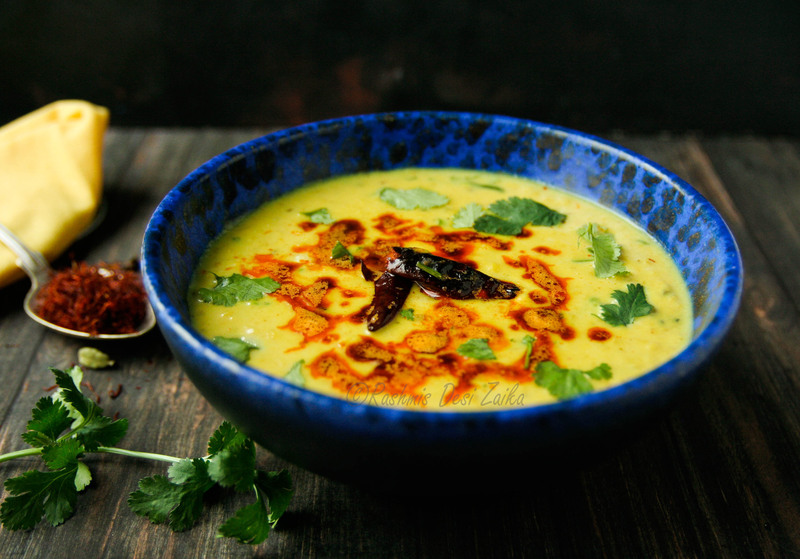 In a small bowl, mix 2 tbsp of ghee with couple of tablespoons of reserved water from boiling rice. 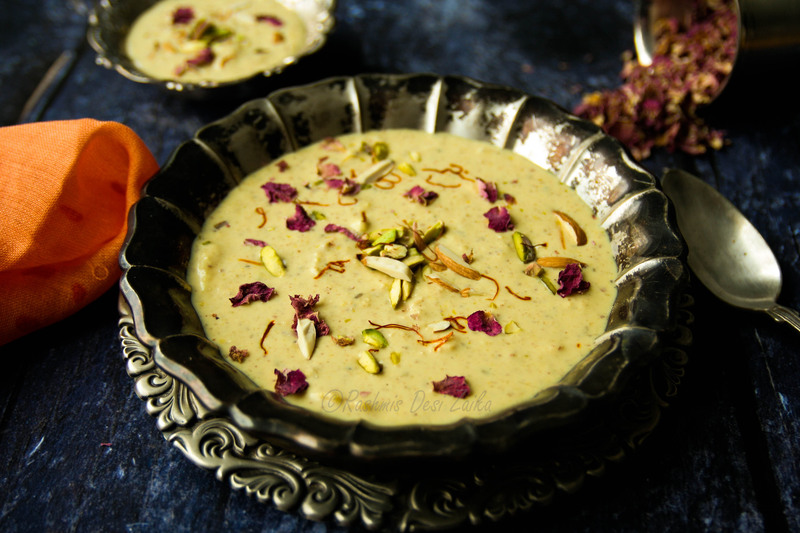 To make saffron milk add saffron strands in hot milk. Let it sit for 5 minutes. Take half of the meat out from the pot and place in a separate bowl. Spread remaining meat uniformly at the bottom of the pot. Layer half of the rice and spread it uniformly on top of meat. Sprinkle half of the remaining fried onions and chopped coriander. Drizzle half of the saffron milk and ghee-water mixture. Spread half of cashew nuts and raisins. Knead the dough using wheat flour or all purpose with little water (30-40 ml). To make the dum, roll out the dough to form a 1 cm thick tube and stick it all around the rim to seal the pot. Place the dum pot now on low heat and let it cook for 20-30 minutes. When done, crack open the dough seal and serve the biryani with yoghurt or cucumber raita.